Apart from the convenience, this is just another coffee maker. 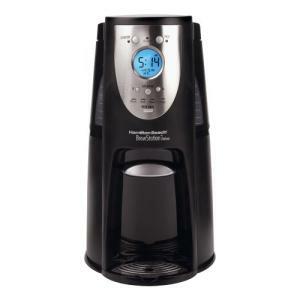 With a 12 cup capacity, programmable clock/timer and separate settings for "Normal, Decaf, Flavor + and 1-4 cups". Huh? A different setting for decaf coffee? Some of the more useful features are a water filter and a built in Gold-tone filter, as well as an adjustable auto-shutoff timer to minimize the "cooking" of the brew as it sits in the coffee maker. This does get points for keeping the coffee in an enclosed chamber at least for heat retention. For me, the ideal setup is a large french press pot and a thermal carafe. You get the best possible brewed coffee, and the best possible storage in order to enjoy it all morning. But hey, I'm all about extremely good coffee more than the convenience of timed brewing and one-handed dispensing. I have more work to do in my pajamas before I can enjoy that sweet, sweet cup of joe. I do like the design of this machine. It's not clunky and the blue backlit clock is a real eyecatcher in the kitchen. That alone would get my attention when shopping for coffeemakers. That being said, the user experience is mixed. Some love this machine, while others have been plagued by problems with leakage, and heating issues. As with anything, buyer beware! A better Hamilton Beach model may be the Ensemble coffeemaker.